Are you one of those who feel that Indian restaurants abroad can’t recreate the same magic like the ones in India? I am definitely one of them. I feel that even a roadside Udupi restaurant beats the food found in fancy Indian restaurants here. This story ..I mean recipe is of one such delectable dish called Tandoori Chicken. The biggest problem with the Tandoori Chicken found here is that it is made very bland.Totally kills it.. (yes..! that’s me getting very passionate about food.) 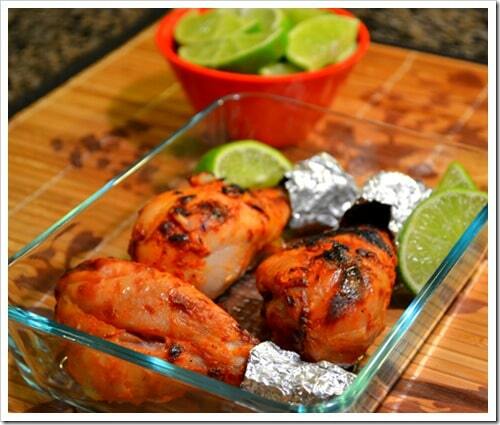 Tandoori Chicken can be had as an entrée or a side dish with Biryanis or rice. You can pair it with Tamarind Chutney or Coriander chutney to give it a kick. I was trying to get to the origins of this dish and as usual our good old Wikipedia did not disappoint. 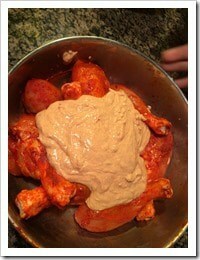 Here is the link to understand the origins of Tandoori Chicken and the recipe can be found here. The recipe itself is quite straightforward..the hard part for me was to capture it properly.Not totally thrilled with how the pictures turned out but the taste of the Tandoori chicken more than made up for it . This recipe has been adapted from the one I found in Sanjeev Kapoor’s website. 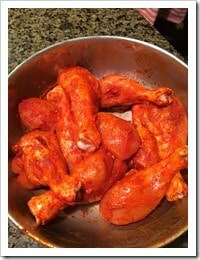 Make 4-5 incisions on the chicken drumstick before mixing it with lemon juice, salt, and chili powder. Set aside for 30 minutes. Use the 30 minutes to hang yogurt in a muslin cloth to drain off the whey. Mix the thick yogurt with the remaining ingredients from the second marinade section - garlic, ginger paste, garam masala, and oil. 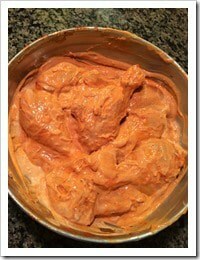 Add the marinated chicken to the yogurt mixture and rub the marinade in the chicken properly. 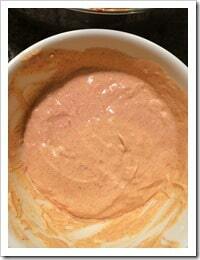 Refrigerate it overnight or for 3-4 hours. 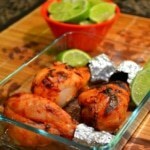 Preheat oven to 375 degrees F. Grease a tray with aluminum foil and place the marinated chicken evenly across the tray. 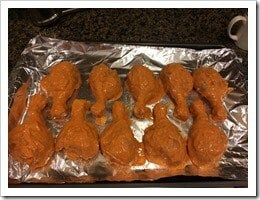 Generously spray it with a nonstick cooking spray and cook it in the oven for 25-30 minutes. Broil on Low for another 5 minutes. Remove and serve hot with tamarind chutney/coriander chutney and sprinkle lemon juice from the wedges before chomping them down.